Some people do not enjoy watching the evening news because they already know what to expect -- negativity. It seems the top stories are always tragic and depressing, and it gets old after a while. The same can be said for the entertainment and sports programming networks. While ESPN continues to be the mecca for sports-related programming, it has begun to get a negative reputation for over-saturating headlines. Whether it's entirely too much Yankees/Red Sox, LeBron James, LinSanity, or most recently -- Tebowmania. Did you know Tim Tebow was traded to the New York Jets? I sure wish ESPN would talk about this more. I would love to know whether he will compete for the starting quarterback job or if they'll use him at other positions. It's only natural that the public wants to know what's going on with the backup quarterback. I mean, everyone knows training camp is the most exciting part of the NFL season, right? As a matter of fact, I want a daily update on what's going on in Jets training camp -- every single solitary day. With the MLB season in full force and the 2012 London Olympics still going strong, I can definitely see why Tim Tebow and the New York Jets would garner so much attention. Is my annoyance with ESPN's man crush on Tebow obvious yet? I understand networks have to report on the top stories and give the people what they want, but there's a point when too much is just too much. And quite frankly, I don't understand why Tebow is such a big phenomenon. I know that Timmy was one of the greatest college football players of all-time and was not expected to be half as great in the pros. I also know that, statistically, that projection was spot on. Tebow put up horrible numbers as starting QB for the Denver Broncos in 2011 -- yet, he figured out ways to make plays down the stretch and the Broncos won the AFC West. Even more impressive, they defeated the defending AFC Champion Pittsburgh Steelers in the Divisional Round of the playoffs. So yeah, the media coverage for Tim Tebow last season was well deserved. He had an unbelievable season, to say the least. 2012 is a new year, however. 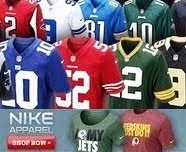 Tebow is now with the New York Jets and is not the starting quarterback (at the moment). Therefore, the attention that he is currently getting is absoultely absurd. Don't get me wrong, personally, I like the guy. He seems to be a good person and an excellent role model. It's all but impossible to hate him. You can disagree with his beliefs or his constant need to bring up his faith in every interview -- but what has he done to give anyone a reason to hate him? The bottom line is, Tebow doesn't ask for all the attention he gets. That is why my gripe is with ESPN. What exactly are they trying to accomplish by continually force feeding us Tim Tebow updates? Many say that all publicity is good publicity, but all ESPN is doing is polarizing Tebow for the fans. I'm sure everyone has a buddy who is always raving about how great their favorite team or athlete is -- Tom Brady (for the sake of argument). After a while, you begin to resent Brady and you really have no idea why. The answer is simple. Your friend just polarized you into disliking him. That is exactly what ESPN is doing. I don't think I am the only person who is getting sick and tired of turning on SportsCenter and knowing exactly what to expect. The Mark Sanchez interviews are entertaining. He seems to be just as annoyed as I am. But please, ESPN, enough is enough already. So the next time you find yourself getting annoyed by all the Tim Tebow talk, don't watch ESPN News for the 3rd consecutive hour -- do yourself a favor and check out The Bleacher Briefings instead. 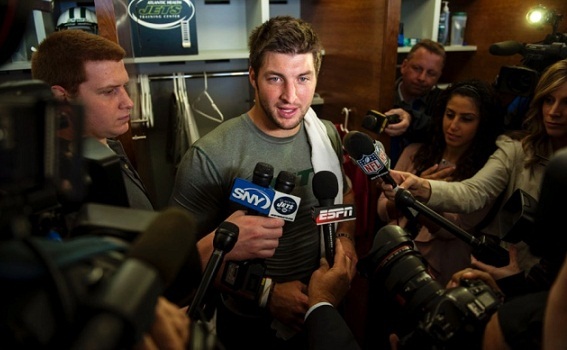 I have no problem at all with ESPN's coverage of Tebow and the Jets. He's a positive role model and a good all around guy. I'd much rather he be overexposed as opposed to some other athletes out there that stay in trouble. I definitely see your point. I'd much rather hear a story about Tebow than some other NFL player getting arrested for something stupid, but ESPN does tend to go overboard with some topics. I'm so sick of hearing about this guy that I could puke. Can't wait to watch him and the Jets go 5-11. I don't care for the Jets much either, but I think they'll finish AT LEAST 7-9. I agree. It's inevitable that he takes over as starter at some point in the season. Lol Poor Sanchez! I'M WITH YOU ON THIS AND IT'S NOT JUST ON TEBOW. ESPN PLAYS THE SAME STUFF OVER AND OVER AND AFTER A WHILE IT GET'S ANNOYING.CAN'T THEY FIND MORE THINGS TO TALK ABOUT? Amen! I usually enjoy watching ESPN -- even the same highlights over and over -- but certain stories are just too much. I rarely get annoyed by them, but this Tebowmania is driving me crazy! Like you said Andy, it isn't Tebow's fault that ESPN wants to follow him around like a lost puppy. People shouldn't hold it against Tebow or dislike the man because of it. Exactly. I like Tebow. He seems like a genuine dude, and I feel bad for him that ESPN gives him too much attention and it's hurting him as much -- if not more -- than it's helping. I agree with Chris Gibson. Tebow is a genuine good person which makes it easy to hear his name over and over. Only bad thing is he's playing for that scumbag coach! I know what you mean. A lot of people can't stand Rex Ryan. It's a bit odd to have Tebow, maybe the nicest guy in the NFL, on quite possibly the douchiest guy in the NFL's team. I'm more sick of people hating on Tebow then I am of ESPN's coverage of him. Let it go already people.